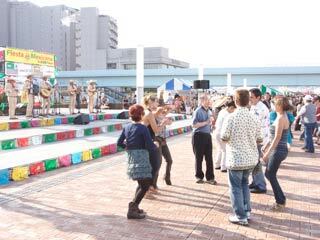 Fiesta Mexicana (フィエスタ・メヒカーナ) in Odaiba Tokyo is one of the biggest Mexican festival in Tokyo. There are many great Mexican food and drinks. If you are big fun of Tequila and Taco, this festival offers what you want. Also, there are Mexican clothes and accessories, as well. In time to time, the great Mexican musicians play great songs. Sponsored by Embajada de Mexico. 1. use Yurikamome to Daiba. Plaza del Sol: The main stage. 9 stores are opened. Calle del Mercado: Market place. 13 stores.